Buffalograss is a fine-leaved native grass species that has prospered on the Great Plains for centuries. It has survived severe weather extremes and has evolved into a water-efficient, sod-forming grass of incredible durability. 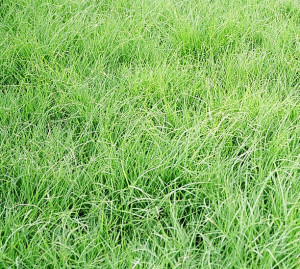 Buffalograss has become very popular as a low-maintenance lawn grass. This hardy grass greens up two-to-three weeks later than Kentucky Bluegrass in spring, and stays green all summer with little or no care. It goes dormant at the first killing frost and turns a beautiful buff color until it breaks dormancy again in the spring. Small shoots have hairs on both sides and edges of leaves. The leaf sheath is hairless. Buffalograss has both male and female plants with the male plant having a flag-type pollen head above the stem. The female plant produces the seed toward the base of the plant. Unlike many native grasses, buffalograss grows as much as 5″within 50 days after planting! In nature, buffalograss germinates very slowly, but after a non-toxic priming with potassium nitrate to break down dormancy, germination can occur within 14 days. With proper weed control, buffalograss spreads fast on runners or stolons (like strawberry plants), but is not a pest. Each node on these stolons sends down a root, which creates another plant. This holds the runner in place. Buffalograss requires six-to-eight hours of sunlight and does especially well on hot, droughty sites where bluegrass dies out. It requires sunlight and well-drained soil and often is used for erosion control.